for sponsoring the giveaway prizes. Backup4all is an award-winning data backup software for Windows. This backup utility was designed to protect the user's valuable data from partial or total loss by automating backup tasks, password protecting and compressing it to save storage space. This backup application is feature rich and offers an intuitive interface making all features easily accessible for both beginners and professionals. The built-in Backup4all wizard can easily set up the user to any backup configurations he wishes. The user can define powerful file filters and schedule backups any way he wants it. Once a backup is performed, the user can see what files changed since the last backup using the explorer-like tree view or he can read the statistics about the next backup execution. With many other backup software programs, files that are in use during the backup may not get backed up successfully because they are locked to prevent programs from modifying the data. With Backup4all the user can back-up open or locked files such as databases, MS Outlook personal folder (.pst), Outlook Express mail archives (dbx files) and others. When defining a backup, there is also the option to run predefined backups, such as My Documents, My Pictures or other custom folder. The user can also opt to receive backup status updates via email on success, warning, error. Backup4all allows the creation of predefined backup using plugins. 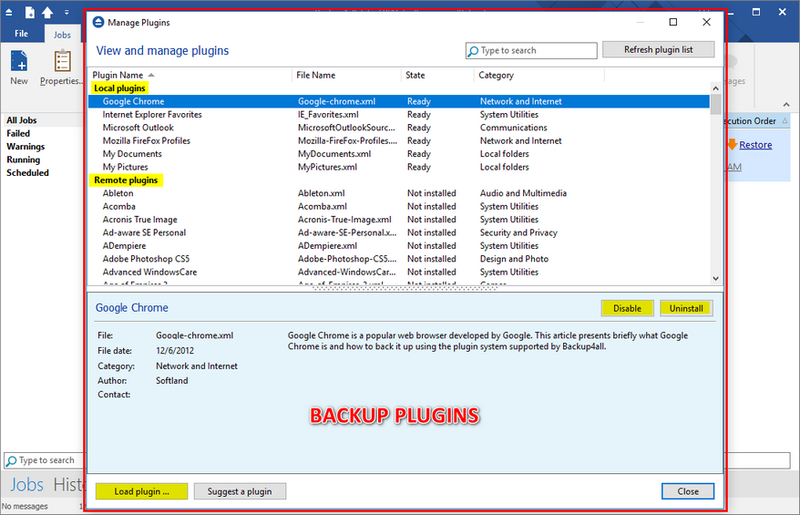 The user can load plugins for either backup or restoring specific program settings or custom data. 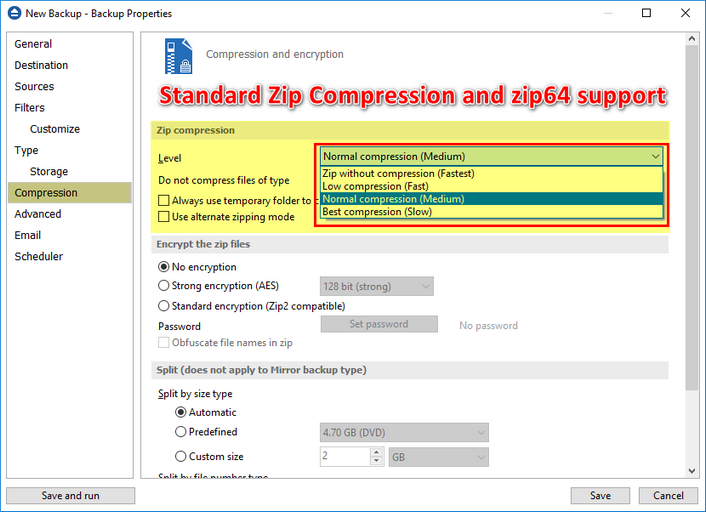 This backup application has ZIP64 support (can create backups over 4GB) and creates standard zip files, meaning that the user can access it with any zip compatible utility. 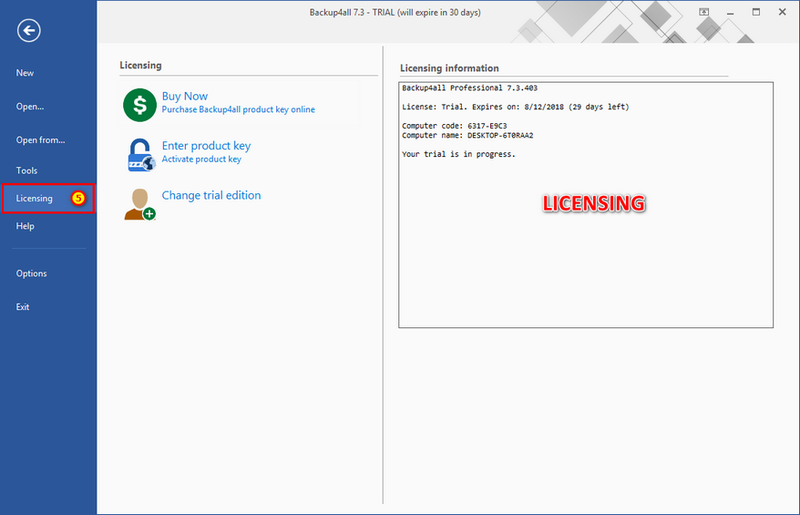 Backup4all also allows the user to encrypt the backup using AES encryption (128/192/256-bit). It comes with its own built-in CD, DVD and Blu-ray burning support so he can easily backup to DVD, CD, Blu-ray or HD-DVD. Just set the destination to DVD, CD, Blu-ray or HD-DVD and execute the backup job. However, (if the user prefers) he can use the UDF format. Backup4all offers five (5) backup types: (1) Smart, (2) Full, (3) Differential, (4) Incremental, and (5) Mirror. Smart backup is a backup type which combines the full, differential and incremental backup types with cleanup operations in order to efficiently manage the backups according with the backup settings and the free disk space in destination. The Smart backup type starts with a full backup. The advantage is that the user does not need to worry about the number of backups to store in order to fit on the destination drive, which backup version to clean or merge. 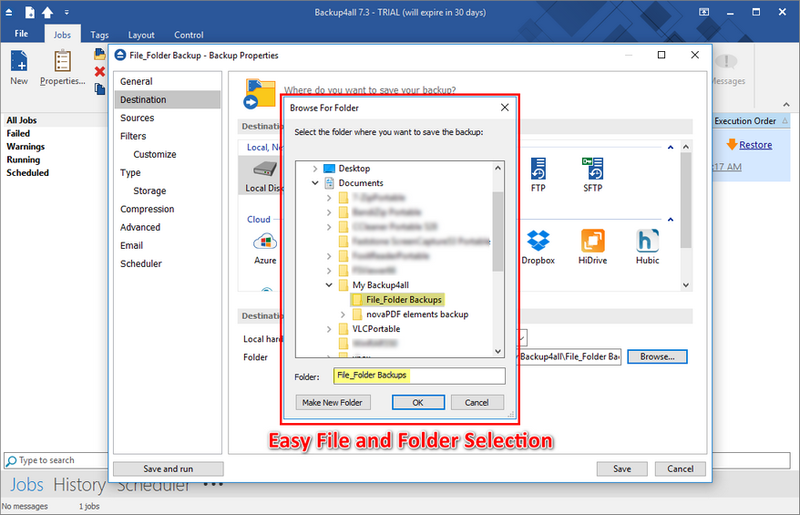 Full backup type will create in destination a zip file with all source files and folders. There are no other options available for Full type. The Differential backup will create in destination a zip file containing all new and modified files since the last full backup. The Incremental backup type will create in destination a zip file containing all new and modified files since the last backup. The Mirror backup will create in destination an exact copy of the source files, without zipping them. The backup types (smart, full, differential and incremental backup) use zip compression to reduce the size of the stored backup versions. The mirror backup type creates in destination an exact copy of the source file without zipping them. 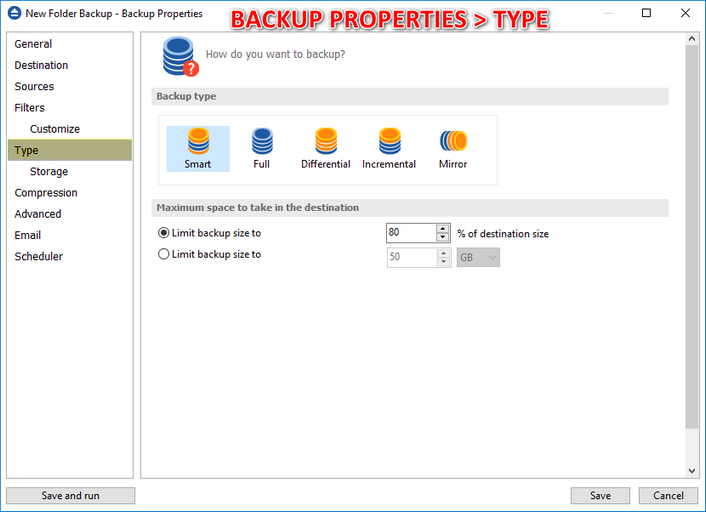 The backup type can be changed from the "Type tab/page" in "Backup Properties", by selecting the icon for the desired backup type. Back-up to DVD, CD, Blu-ray, HD-DVD, or other removable media (such as USB drives). Backup online to Google Drive, MS OneDrive, DropBox, Amazon S3, MS Azure, BOX, Hidrive, Hubic and over 37 Amazon S3 Compatible cloud destinations. Backup4all is compatible with Windows 10, 8, 7, Vista, XP, Windows Server 2012, and 2008 Server/2003 Server and requires approximately 50MB of free disk space. Backup4all comes in three editions: Lite, Standard and Professional. There is also a special version which is Backup4all Portable which is a version that can only be installed on portable USB/Firewire devices. 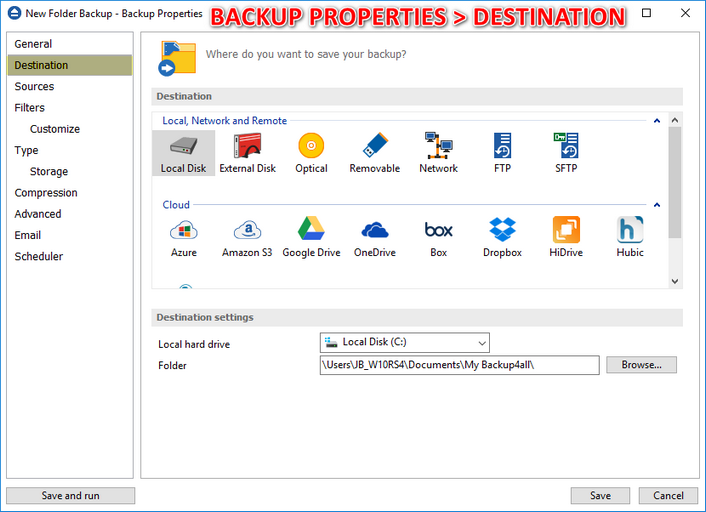 With Backup4all cloud backups are a synch giving the user more options other than the popular Google Drive, Microsoft OneDrive, Dropbox but more like Amazon S3, Microsoft Azure, BOX, Hidrive, Hubic and over 37 Amazon S3 compatible destinations (i.e. Cisco, Google Cloud Storage, Hitachi, Tiscali, Verizon). Any user of Backup4all will benefit from the most powerful infrastructure for protecting online data. Block-level Backup speeds up the backup process of large files as it "only" backups up the modified blocks of data instead of the entire file. 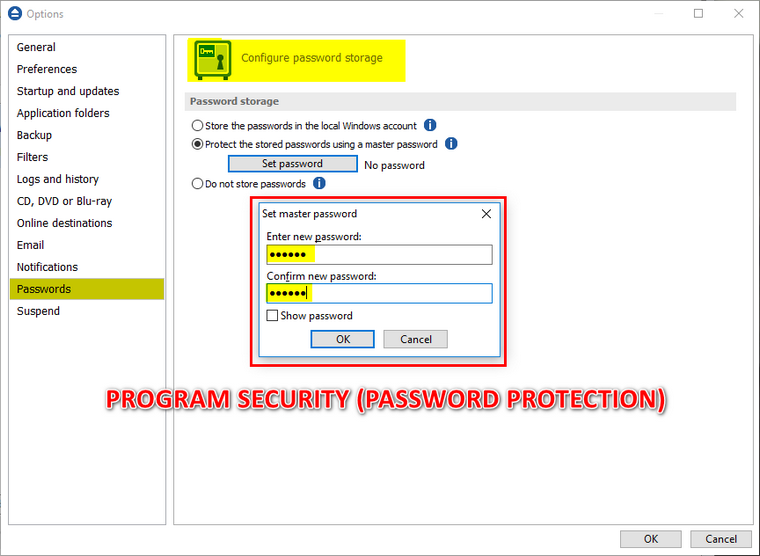 Thus if the user has a backup job for a large Outlook profile, (whenever the user get a new email) Backup4all knows to backup only the bits of data that are modified in that Outlook profile rather than the whole PST file. Backup4all shows messages when certain action occur (i.e. when backup job is done or an error occurs). These are shown via a pop-up window or be silently saved in the "Messages" panel. The Getting Started window allows the user to easily define/run backup jobs or restore backed up data. Switching to the Explore View, the user can see all the files/folders that are in the backup job and the new files that will be stored at the next backup execution. The user can sort and search the file tree in Explore view. The user can start this backup application at windows startup or minimize it to the system tray. Backup4all uses the Volume Shadow Copy service that allows the user to back up local open files from NTFS partitions. User can backup the user emails and settings without closing Microsoft Outlook, Outlook Express or other email clients. Powerful file and folder filtering engine with lots of options to filter by attribute, size, date, name and type. The user can create filters using a combination of restrictions and can define separate filters for inclusion and exclusion. Filters can now be added through the Options window, and once set, the user can use them in any backup job. A predefined filter of a specific backup job is also automatically modified on that particular backup job "if" a change in the predefined filter set is done. This backup software comes with its own built-in CD, DVD, HD-DVD and Blu-ray burning support. Just set the destination to the CD, DVD, HD-DVD or Blu-ray disc and execute the backup job. However, if the user prefer not to use Backup4all's built-in burning engine, he can use 3rd party packet writing software (such as DirectCD or InCD). Backup4all also has the possibility to erase CD-RW/DVD-RW/HD DVD-RW/BD-RE media. The user can easily setup a powerful scheduler using the available scheduler configurations to make unattended backups. Backups can also be scheduled to run when the computer shuts down. This backup software allows defining multiple backup jobs and saving them for future use. On the main form, the user have an overview of all defined backups organized in groups. Backup4all comes with several predefined backup jobs: "My Documents", "My Pictures", "Outlook Express", "Mozilla Firefox", "Mozilla Thunderbird", "IE Favorites", "Backup4all configurations" and allows importing backup plugins for dozens of other applications. Backup4all can be configured to send custom emails after a backup is finished whether it be a successful backup, with error or with warning. Additional options is also given to attach a backup log file to the email sent and allows sending to several email addresses. Backup4all can backup to SFTP, a destination combining the security of remotely stored backups, with secure file transfer protocol. The user important data is transferred to the SFTP backup server using a secure network connection to avoid risk of data interception. The backup operation now supports pausing and resuming, so running a backup job can be interrupted and continued at a later time. There is also a Stop operation now, that when pressed will not Cancel the backup, but instead will save everything until that point when it was pressed. 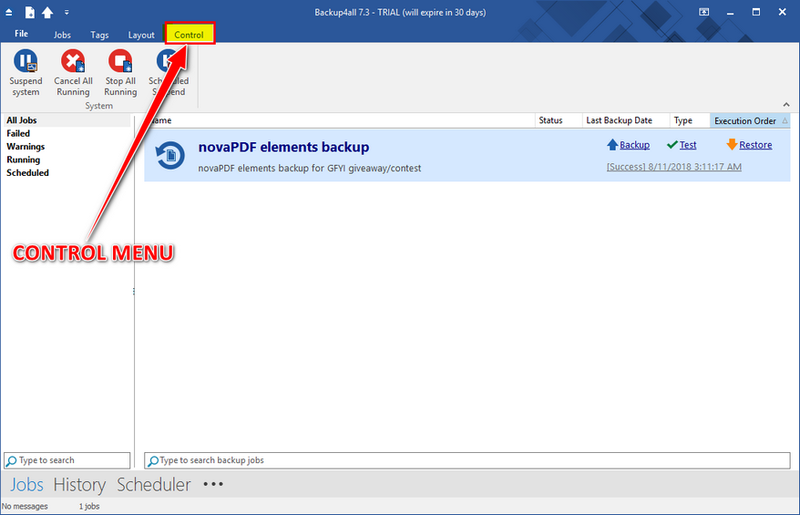 Backup4all can now check for updates either manually or automatically at a scheduled date. This allows the user to better stay in touch with the latest development of Backup4all. Backup4all stores a summary snapshot of the file and folder information into a backup catalog file (.bkc) each time a backup is executed. This catalog is stored in a different file than the backup itself and it allows Backup4all to keep track of the backed up files. The advantage of using a catalog is faster backup execution. Another advantage is that the user can run Backup4all together with other backup applications because they will not interfere with each other. Backup4all allows backup to remote locations using FTP service (with SSL support, active/passive transfer modes, firewall support, XCRC tests). The user just have to select FTP as destination of the backup, enter the FTP configurations and the user are now ready to backup! Backup4all allows the user to store the backup in a local folder, on another computer in the same LAN, on media such as: CD-R, CD-RW, DVD±RW (single/dual layer), DVD-ROM, HD DVD-R, HD DVD-RW, HD DVD-ROM, BD-R, BD-RE (single/dual layer) on USB drives or other removal media, or remote destination. Backup4all gives the user different backup types to choose from: full backup, differential backup, incremental backup and mirror backup. Perform extra actions before and/or after backup execution. Backup4all allows the user to create a shortcut of a backup job or backup group to a desired location and once created, he just has to double-click the shortcut and the backup job will automatically run. The user can make it a "one click backup" if he places it in the Quick Launch menu. File warnings are displayed to the user during the execution of the backup (if opted to) and it is written to log file. The user can customize prefixes for the zip archives which store the backup versions as well as support for file/folder paths longer than the standard 260 character parsing. Aside from normal password protection of zip files, Backup4all supports 128-bit, 192-bit and 256-bit AES encryption. These reflect the encryption key size used to encrypt data - a higher key strength provides stronger encryption. Mirror backup type makes an exact copy of the selected files and folders (copying NTFS permissions and alternate streams), including empty folders as well. Optionally the user can choose to zip the backup files individually. User can actually see the number of files that will be processed at next backup. Automated support for splitting the user backup between many removable disks or even on the same media. Size of the zip archives can also be specified. A command line version of the backup application is available. Backup4all offers an option to lock its interface so settings are protected. To access it a password is required. 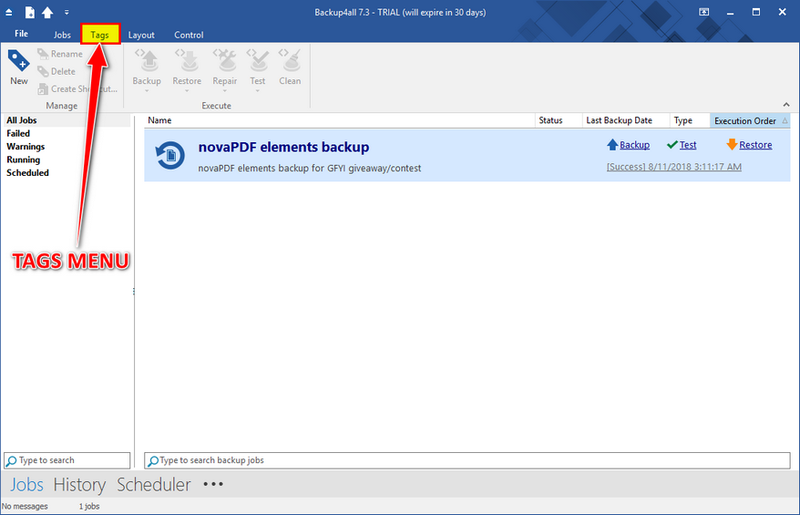 This backup software provides step-by-step instructions to create a new backup job by selecting Where, What, How and When to backup. Likewise the user can restore backed-up data step-by-step. He can choose the version of the file/files want restored, filter them to restore "only" what he needs or restore versions of a backup in reference to a specific date. User can browse a folder tree to select several files and folders as source of the backup or the can include or exclude them individually. Multiple files/folders can be added as Sources at once (drag-and-drop supported). If the zip file size is less than 2 Gbytes, Backup4all creates standard zip files. This format is compatible with any zip utility available on the market. Unlike other backup software, for zip files greater than 2 Gbytes, Backup4all uses zip64 technology (which allows unlimited zip file size). Backup4all tests the backups using CRC32 ensuring that the files have been backed-up properly and that the backup made is safe and secure. When needed backup integrity test can be done at a later time. Starting with version 3.10 is possible to load plugins to backup/restore the settings of specific programs. A plugin is actually an XML file that once imported in Backup4all adds a predefined backup. For instance, a backup plugin for Mozilla Firefox, when loaded, will automatically add in the Predefined Backup list an entry for Firefox, so when defining a new backup job if that’s selected, the Firefox profiles will be added as source for the new backup. 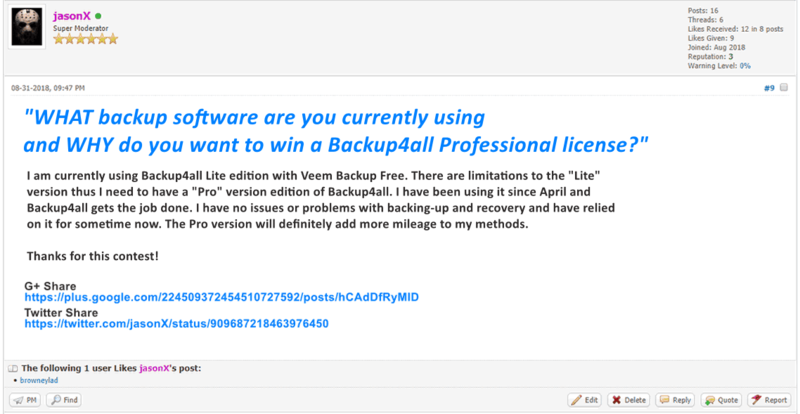 "WHAT backup software are you currently using and WHY do you want to win a Backup4all Professional license?" Post your answer WITH your social media share. Please see sample entry below. Optional: You may want to like/follow Backup4all's social networking sites as added support. GIVEAWAY / CONTEST IS OPEN!!! I am currently using no file and folder backup software. I would like to use Backup4all pro because it tests backups using CRC32 ensuring that the files have been backed-up properly and that the backup made is safe and secure and supports 5 types of backups.